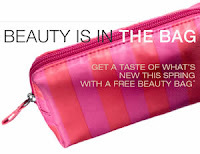 FREE Spring Beauty Bag Packed w/ Samples & More! Yay! Target is giving away free spring beauty bags again! I love these, they are full of goodies: Beauty Bag stocked with all new spring essentials. Beauty bag stocked with coupons and goodies from Nivea, Nexxus, Pantene, L'Oreal, Neutrogena, Simple and more! NOTE: I had to refresh a few times for the request to go through. Keep trying if the request form freezes up!